1. In a bowl, combine the sugar, flour, cinnamon, and butter. 2. Work the mixture with your fingertips until well blended; refrigerate. 1. Set the oven at 375 degrees. Butter an 8-inch-square metal baking pan. Dust the pan with flour, tapping out the excess. 3. In another bowl, whisk the remaining flour, baking powder, and salt to blend them. 4. In an electric mixer, cream the butter and sugar until soft and light. Beat in the egg and vanilla until soft and light. With the mixer set to its lowest speed, blend in the flour mixture alternately with the milk, beginning and ending with flour. 5. Remove the bowl from the mixer stand. 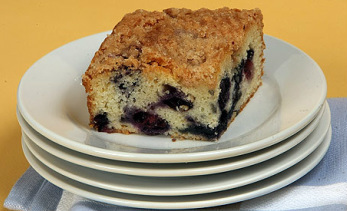 With a rubber spatula, fold in blueberries. Transfer the batter to the pan and smooth the top. Sprinkle the topping over the cake. 6. Bake the cake for 40 to 45 minutes or until the top is brown. Adapted from Jane Connelly- Jane Connelly of Scituate sent this cake into the Recipe Box Project, for Boston Globe readers to share their favorite dishes. It won first prize in the summer of 2011. A Hokum Rock Farm patron brought it to us to share with others.